The FES-X is a backup switch for 100Base-TX links. 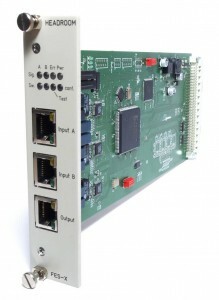 It switches automatically and/or manually controlled by the system controller (SNMP/web). For autoswitching it uses a Link up/down monitor and a software selectable activity monitoring is employed. The user can read the net input transmit bitrate per input and set the activity threshold accordingly with 100kBits/s granularity. The FES-X has no MAC addresses on its ports it is completely transparent for the connected devices. The last set route is hold through powerfail bypass relays. So there is no single point of failure! The FESd-X offers a user adjustable delay in output transmit directon of up to 1.34 seconds. This delay can be used for compensating network latency or adding a launch offset for one transmit path.